Wolf Creek Pass: The Second Coming: An update on the “new” album from C.W. McCall. ’Round the Waist with the Rubber Duck: It’s a hold-up. Critters In the Wild: Bob Norton takes a break. The remastered, audio CD of Wolf Creek Pass was released on August 21. You can find it at Amazon for $17.99. It is ranked, as of today, as #29,679 on Amazon’s Best Sellers in Music. That’s a drop from its first ranking, when it reached a high of about #4,602; which is still not bad for a semi-greatest-hits collection from recordings over thirty years old. The remastering of all of this album’s tracks is great; far better than what was done for the previous collections The Best of C.W. McCall and C.W. McCall’s Greatest Hits. But don’t trade away your other CDs! Only 11 of the tracks on this new Wolf Creek Pass appear on those other two CDs. There is only one flaw that I’ve found with this album: on the inside back cover of the booklet is a credit “Thanks to: Ed Floden and Bill Fries”. Obviously, it should read “Thanks to Bill Fries and Ed Floden”; I know my place in the universe. 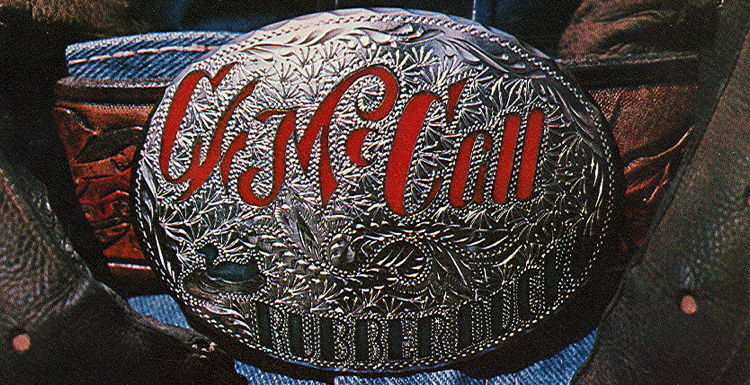 Garry Jorgenson was the creator of the “Rubber Duck” belt buckle that appears on the cover of the album Rubber Duck; it also appears as the “home” image in the upper-left-hand corner of most pages on C.W. McCall: An American Legend. His son, Jason, informed me that his dad passed away on October 14, 2011. “CB lingo is a bit ‘smokey’ to teens”. There is also a “Convoy” board game, which I have; I’ll tell you about that next month. The latest review on The Thinking Chick’s Guide: The Dark Knight Rises (2012). Bob Norton took a few days to drive around the San Juan Mountains. Work has kept me from visiting Colorado San Juan Mountains much in recent years. Still, I took the opportunity for a quick run recently. Arrived Thursday evening July 26th and had to return to New Mexico Sunday July 29th. Two full days of trail runs near Silverton, Colorado at the Southwest Four Wheel Drive Association Summer Quarterly Meeting. Revisited Animas Forks and ran Cinnamon Pass, plus other side trips. 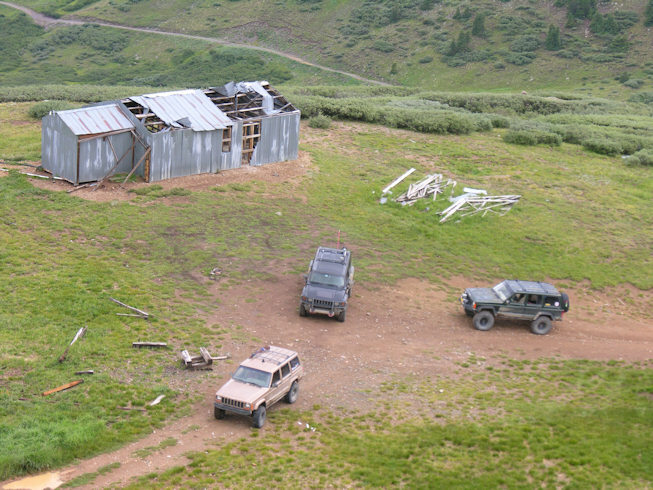 The following day, scouted several Gulches and side routes NE of Silverton. It was wet, very, very wet! Yet, not enough to dampen my spirits to again breath free at 11,700 to 12,700 elevations again and again! My white Jeep Cherokee that appears in older threads/articles has long ago worn out... my current ride is a gold '99 Jeep Cherokee. From the 2003 July 28 issue of The Legend-News. Bill Fries, the real C.W. McCall, was interviewed by Cliff Abbott of Roehl Transport for the November 2002 edition of their CD newsletter, the Roehl News Network. (By the way, their name is pronounced “rail”.) Roehl News Network is a bi-monthly publication for their drivers; its contents include safety tips, information on trucking-related issues, and interviews with, and the music of, country performers. In this edition of the Roehl News Network, we’re proud to have as our guest Bill Fries, who personified the character of C.W. McCall. Bill, how does a person go from an everyday job to a storybook career like you’ve had? Bill Fries: Well, it’s a, it goes back to a lot of experiences that I’ve had, growing up as a little kid in southwest Iowa. BF: Yes, sir, I’m an old ad man. We started out that, the first commercials that we did for Metz Baking Company up in Sioux City, Iowa led to the creation of a character that I wrote for him to lip-sync the words to my lyrics in the commercials. And dog-gone if they didn’t take off and become really sensational around the Upper Midwest: you know, Nebraska, Iowa, South Dakota, and so on. BF: The record companies heard this, and they said “Why don’t you make that into a record, and, you know, we’ll distribute it nationally.” So I said, “Hey, why not?” and suddenly my life was turned around, completely. RNN: But that first album wasn’t your most popular, was it? BF: We did another album for MGM Records, and on that record was a little thing called “Convoy”. BF: It’s sold now around twenty million copies worldwide, and it’s been just a monster, you know, like you say. RNN: And the song “Convoy” eventually led to a movie. BF: Well, after the record was out, about two years later, MGM came to us and had an offer from a producer in Hollywood and said, “We’d like to use your song as the basis for a movie.” And we said, “That’s great! All we wanna do is write the music for it.” And so they did, and they put out this movie called “CONVOY” which was written by an unknown scriptwriter who really didn’t do the song justice. You know, I thought that it should a’ been a lot funnier than it was. But anyway, Kris Kristofferson and Ali McGraw were in it, and it did quite well around the world. RNN: Let’s talk about your relationship with the trucking industry. How did you come to understand drivers the way you do? BF: My dad was a trucker, and he used to haul flatbed semis all over the Midwest with prefabricated farm buildings on ’em. And I used to ride along as a kid; I learned a lot about trucks then, but I never, you know, got to be a truck driver. But I admire those guys out on the road, I’ll tell ya. RNN: They have a difficult job, don’t they? RNN: Here’s another C.W. McCall classic you might remember. “The song should be self-explanatory. I just thought the country should be cleaned up,” said Bill Fries. "Fly Our Jets To Paradise"
“There Won’t Be No Country Music (There Won’t Be No Rock ’N’ Roll)” can be found on the albums C.W. McCall’s Greatest Hits, The Best of C.W. 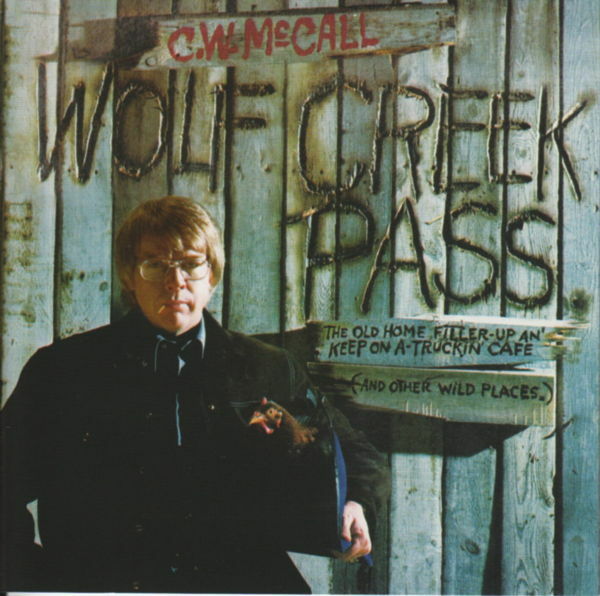 McCall, and Wolf Creek Pass (the 2012 release). It was rerecorded for the album The Real McCall: An American Storyteller .